On Tuesday, at GMT 12:30 a.m., the Australian Bureau of Statistics will release the month-over-month home loans figure. It measures the changes in the number of new loans approved for owner-occupied homes. Most home purchases are financed by banks and the new home loan figure acts as an excellent gauge of how many qualified buyers are ready to take out home loans. Therefore, economists and Nadex.com traders consider the changes in the new home loan figure to be a leading indicator of the overall economic situation in the country. Last month, the Australian new home loans decreased by -2.3%. Analysts are expecting it to decrease by an additional ease of -0.1%. On Wednesday, at GMT 12:30 p.m., the US Census Bureau will release the national month-over-month retail sales figure. It measures the changes in the total value of all sales made at the retail level in the country over the past month. Last month, the US retail sales value decreased by -0.3%. Analysts are expecting that this month, it would likely increase by 0.3%. The AUD/USD was range bound between 0.7735 and 0.7980 for last several weeks. Earlier last week, the pair once again turned bullish and broke above the downtrend line. Currently, it is approaching the resistance near the 0.7890 level. The Australian home loans figure is expected to decrease by -0.1%. On the other hand, the US retail sales figure went down by -0.3% last month. While there is a possibility that the retail sales in the US will rebound this this, if it once again comes negative, it will set a bullish fundamental outlook for the AUD/USD this week. 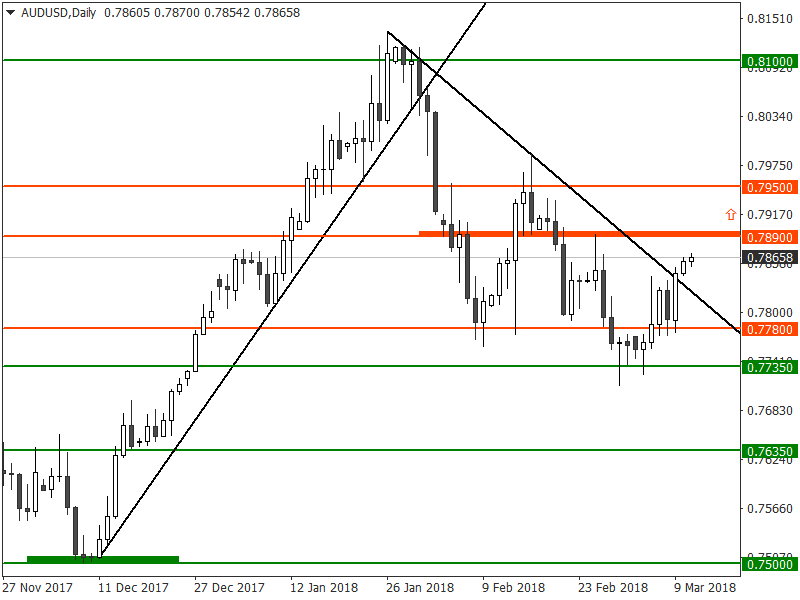 Therefore, if the AUD/USD closes above the resistance near 0.7890, it would likely attract additional bullish momentum in the market. Hence, US binary options traders should look out for trading opportunities above this major resistance level around 0.7890. As the BTC/USD fell towards the 6,000 level, it found a strong support. 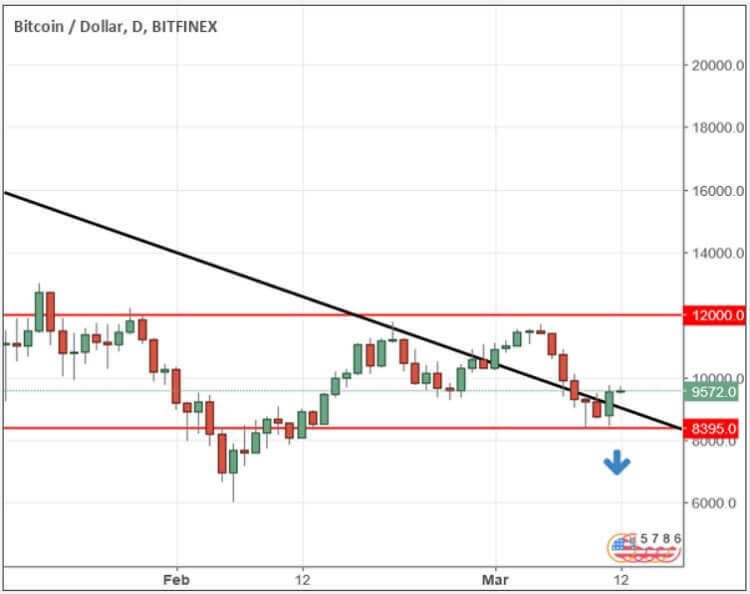 However, in the last few weeks, the BTC/USD started a bullish retracement and broke above the downtrend line. But, it soon started trading sideways between the 8,395 and 12,000 levels. Currently, it is trading just above the support around 8,395. After new broke out last week that the Japanese Financial Services Agency (FSA) suspended two cryptocurrency exchanges in the country for failing to protect customer interests, the BTC/USD bearish momentum accelerated. Given that Commodity Futures Trading Commission (CFTC) Chairman Christopher Giancarlo also commented about cooperating with foreign regulators, we believe the bears will likely dominate the bitcoin market this week. Hence, US bitcoin traders should look out for trading opportunities below this major support level around 8,395. Nadex, company based in Chicago, is one of few US regulated binary options exchanges platform . Secure Trading with 24/7 Customer support. Read Nadex.com review.